Atelier Sophie Krier » La culture c’est d’abord la terre. La culture c’est d’abord la terre. 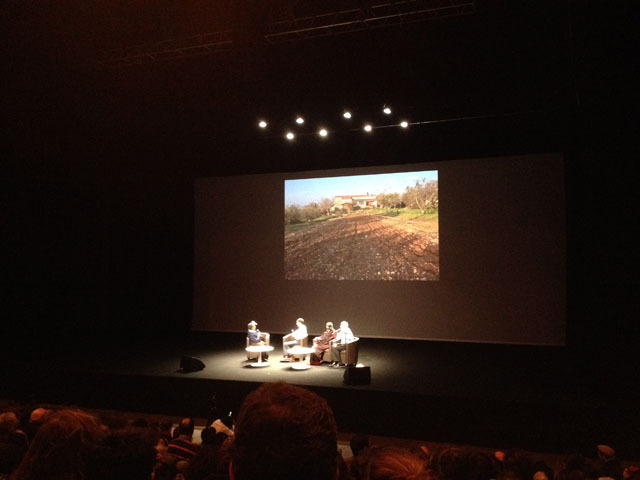 Yesterday night in the Grande Halle of La Villette two beautiful disobedient minds met: Indian quantum physician, environmental activist, alter mondialist & eco feminist Vandana Shiva, and Algerian thinker, author and agro ecologist Pierre Rabhi. With his words “La Culture c’est d’abord la terre” (Culture – i.e. cultivating – is primarily about the earth), Pierre Rhabi cancels the nature-culture bias that has dominated, and still dominates the Western view of humanity where everything that is man-made is seen in opposition to, and outside nature. We are nature, and need to reinvent ourselves as part of it. Although the podium was far too large, the screen too big and the lights too bright to allow for a truly intimate conversation, Shiva and Rabhi clearly didn’t compromise, and gave the 1000 person audience what they had come for: words of hope and resistance, and the proof that every bit helps. La culture, c’est d’abord la terre. (Culture, is before everything else, earth). Life is about cultivating beauty.